If I want to create a group price discount, how do I set the minimum number of tickets that must be purchased? /Creating, Editing and Managing Events /If I want to create a group price discount, how do I set the minimum number of tickets that must be purchased? 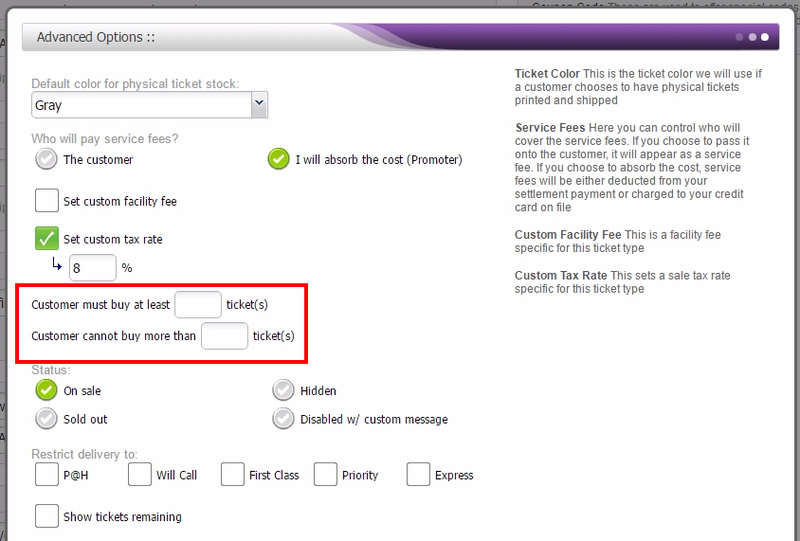 This can be done by creating a new ticket type with a particular price and minimum amount of tickets required to order. While editing your event, go to “Ticket Pricing and Options”. Go to the ticket type that you would like the group pricing to be on. Select “Options”. Here you are looking for the “Customers must buy at least” option. Select the minimum number of tickets and then hit “Update Options”. Make sure you set the group discount price to what it needs to be per ticket and add the description letting your customers know what the minimum is. Click on Update Event at the bottom of your Edit page and you are all set! ADVANCED TIP: To use method #1 while still sharing the inventory of your primary ticket type, you can create a “Group/Package” ticket type and have the system issue that primary ticket when the person purchases the discounted group price. For example, let’s say you are selling VIP tickets for $50 and only have 100 to sell. If you wanted to offer a $5 discount when you buy 10 or more VIP tickets, you can create a “Group/Package” ticket type, set the price to $45, require a minimum of 10 tickets to be purchased, and have the group/package issue just 1 of the VIP tickets for each package purchased. This allows the normal VIP ticket type and the VIP Group Discount to share the same 100 tickets available to sell. You may also accomplish this by creating an automatic applying coupon code. This way you can use your original priced tickets and set a coupon code to automatically apply when certain criteria is met. While editing your event go down to the bottom of “Ticket Pricing and Options” until you see the plus sign and “Add coupon code”. Click on that plus symbol and enter the coupon code menu. Enter all of the criteria for Minimum amount of tickets and the discount amount for them. 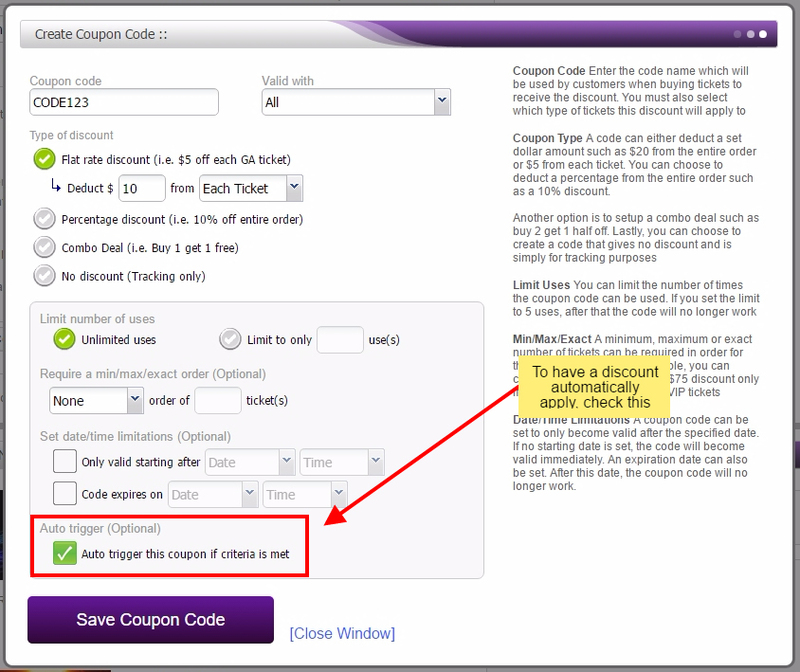 Make sure you select the option at the bottom that reads “Auto trigger this coupon if criteria is met”. Save the coupon code and update you event page at the bottom then you will be ready to go with this method.